Cupid flies over the screen with a banner that says "Season Finale". A dragon appears and burns him and the banner. "Orange Is the New Yellow" is the 22nd episode of season 27 and it aired on May 22, 2016. It's the season finale. 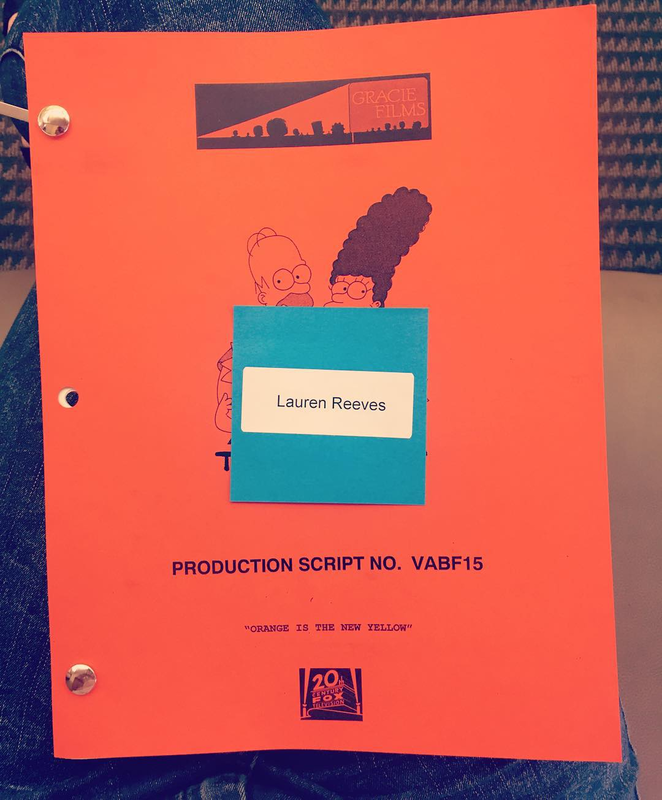 "When Marge gets arrested for letting Bart go to the park unsupervised, she serves time only to realize that prison is a welcome break from the demands of her life as a mom and wife. 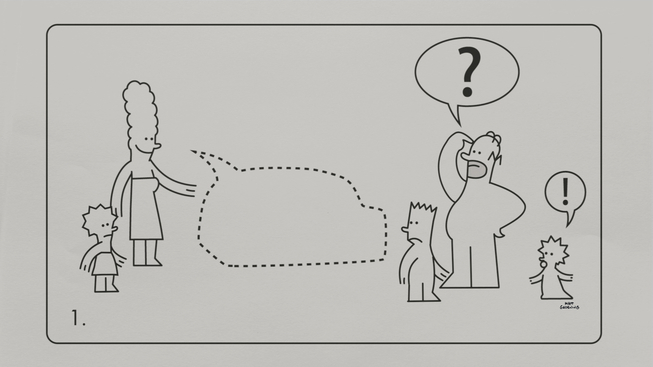 In her absence, Homer struggles to manage all of the parenting responsibilities that Marge usually handles." 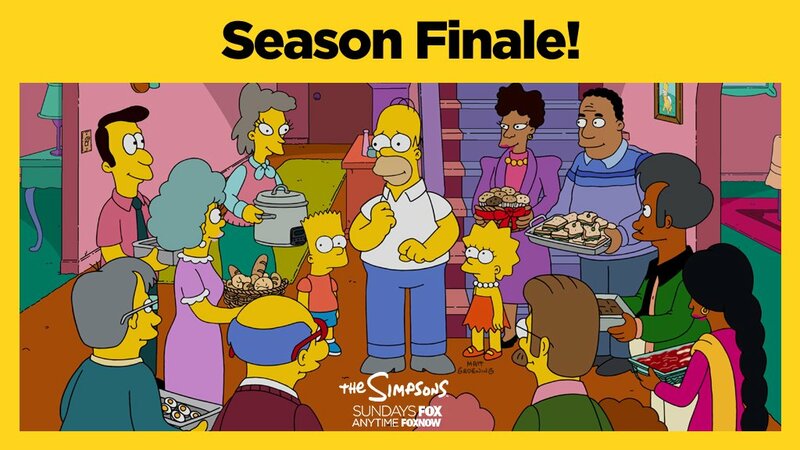 Homer was leaving the Power Plant on Thursday and received a phone call from Marge, promising her to come home for dinner, however he's stopped by Mr. Burns asking him to fix a gas leak by covering it up with a "safety first" poster. However, Homer gets delayed by Mr. Burns requiring its level to be measured with a plumb bob (procedure that takes three hours to complete). At home, Marge has trouble with the kids, and when Lisa asks for her help dressing her as a male seahorse while feeding Maggie, Maggie spills her food all over. Bart offers to clean up, but combines chemical products creating a hole in the floor. Marge sends him to play outside while she cleans the mess, and Bart goes to Springfield Park, where Martha Prince sees he's unattended and calls the police. 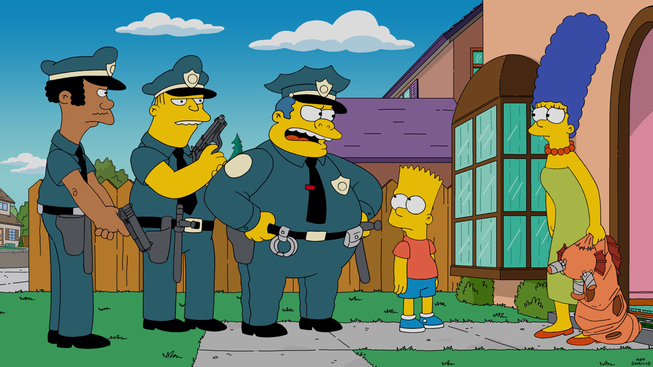 Taking Bart back home, Wiggum arrest Marge for leaving him alone outside. 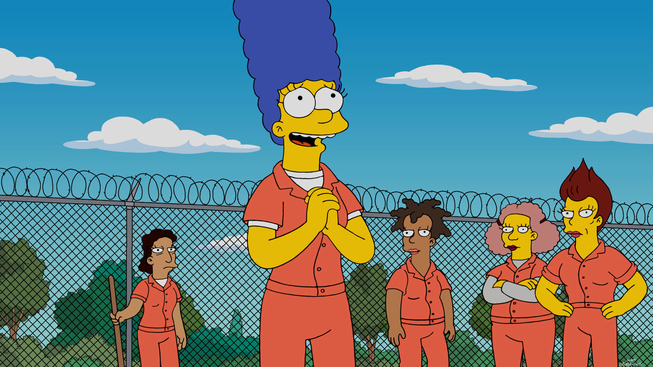 At the trial, after trying to convince the judge, with the result of her mother being arrested too, Marge is sentenced to ninety days at the Springfield Women's Prison. In jail she realizes that she can have time for herself away from the chaotic home. 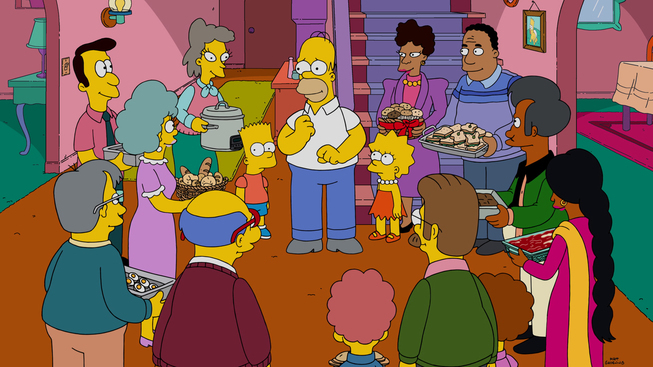 Meanwhile, Homer is helped by Ned Flanders and the other neighbours to deal with being alone dealing with the kids. 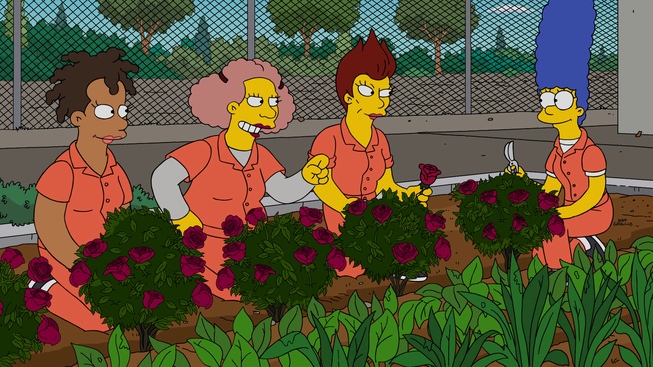 In the prison, Marge fits in well, uses her hair to fight against bullies and attends flowers in the garden, and being happy there, she refuses to be set free when the Blue-Haired Lawyer finds a loophole to get her out and fires a guard's gun and gets two more months in jail. Parents become overprotective over their kids after what happened to Marge and starts walking them on a leash, with Homer as a sitter. Having had enough of their attitude, the kids decide to break from Homer's care and go to the park, where they end up finding themself in trouble when a tornado forms. 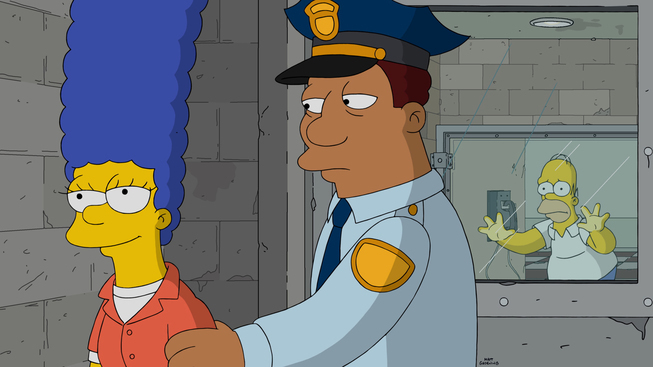 Back at the prison, Marge sets the other on prison break by mistake, and in the middle of the chaos, Homer, undercover as a prison guard, helps her escape to safety, her hair ricocheting a warning shot from a guard to stop her from breaking. Back home, Marge can't get away from Bart and Lisa becoming overly attached to her and the whole family ends up hugging inside the closet. Modified on January 15, 2018, at 14:42.